Unlike other companies, LG doesn’t wait two years to revamp its flagships, but they rather do that every year. LG G3 was the first Quad HD phone, LG G4 was all about the calf skin and G5 had modularity. The LG G6 premiered 18:9 curved corner HDR screens and wants to be so much more than the G5. We reviewed it over the following lines and you can get it right now priced at $700. The flagship debuted at MWC 2017 and it ditched the LG G5 modularity, but also sacrificed the Snapdragon 835 CPU in favour of a Snapdragon 821, because rivals like Samsung monopolized them all. This time the handset is water and dust resistant and it’s also classier. It’s got glass at the back and front. There’s an 80% screen to body ratio here. We’ve got a 5.7 inch diagonal and LG remains one of the few companies that still place Power buttons at the back. The build is rather solid and the handset is comfy, albeit a bit tall. Buttons are comfy, all of them, even the back one. The back side of the flagship is a fingerprint magnet and back to the build, we’ve got a solid metal frame here and all in all this is a pretty narrow phone, that fits great in the hand. The waterproofing is at IP68 level and surprisingly I did some digging and found that there’s also MIL STD 810G certification for shocks. LG G6 measures 7.9 mm in thickness, which is the same as the Galaxy S7 and weighs 163 grams. Meanwhile, the Galaxy S8 measures 8 mm in thickness and weighs 155 grams. HTC U11 measures 7.9 mm as well and weighs a heftier 169 grams. Available in black, white, gold and blue the phone is clearly lighter than the LG V20 and the design manages to stand out of the crowd even in 2017. Moving on to the display, it’s certainly unique and better than the LG G5’s, for the simple fact that the 2016 model had light bleeding issues. In this case case we get a 5.7 inch Quad HD Plus panel (2880 x 1440 pixels), with Full Vision Tech, 18:9 aspect and Dolby Vision HDR. The latter provides better dynamic range and contrast, making movies look great. The panel is an IPS LCD with rounded corners, something that only LG and Samsung have done so far. We didn’t have a video player, so we had to resort to the Gallery app. The video watching experience is great and we enjoyed the details and vivid colors. I feel that the colors tend to pop up less than on an AMOLED panel, to be frank. I’m happy with the brightness and contrast and the view angles are quite wide. Pixels have an RGB Stripes arrangement and the luxmeter showed a value of 418 LUX. It’s good, but it’s no champion. This result is superior to the 365 LUX of the LG G5 and also surpasses the LG V10 and HTC U11. It also scores below the Xperia XZ and Galaxy S8, by the way. Settings of the screen are very generous, including ones for Homescreen (Easy Mode, App Drawer or not), screen swipe effect, icon shape and app grid. There’s also the Always On option, Smart Bulletin and Theme. But wait, there’s more! You can tweak the font (type, size, bold), app scaling (16.7:9, 16:9 or 18:9). There’s also the Display Size option and Comfort View, plus brightness and somehow in spite of the many options, there’s no color tweak. The novelty factor remains the biggest draw of the screen. Moving on to the other hardware, there’s a last gen Snapdragon 821 CPU here, the one that powered the Google Pixel XL. There’s 4 GB of RAM to accompany it, 32, 64 or 128 GB of storage and a microSD card slot. Typical for a flagship, the device doesn’t suffer from lag and runs quite OK. It’s a fluid machine, but we do wish it had a newer CPU. Games like Riptide GP Renegade run like champs, so no problem in that area either. We also did a bunch of benchmarks, like Quadrant, in which we scored past the Moto Z and below the Galaxy S7 Edge. In AnTuTu we scored above the OnePlus 3 and Google Pixel XL, but below the Galaxy S8 and HTC U11. In 3DMark Ice Storm Unlimited the scores were above the Huawei Mate 9 and Huawei P10, but somehow below the Galaxy S7 and of course the S8. In GeekBench 4 we beat the Google Pixel again, proving that among the Snapdragon 821 phones, this one has no rival. The temperature was OK in GFXBench, at 37.5 degrees Celsius, but huge, at 47.9 degrees in Riptide GP Renegade. It’s actually one of the hottest phones we’ve test in 2017 and we don’t say that as a compliment. Now let’s see what the battery can deliver. LG G6 packs a 3300 mAh battery, of the Li-Po kind, an upgrade from the LG G5’s 2800 mAh battery. It provided in our video playback test 11 hours and 37 minutes of video playback, good enough for one season of Netflix. It beats the Galaxy S6 Edge+ and the ASUS ZenFone 3 Max, plus the LG G5. It’s inferior to the Google Pixel XL and Galaxy S8, just so you know. In PCMark, the continuous usage test we achieved a very underwhelming time f 5 hours and 27 minutes, which is poor. 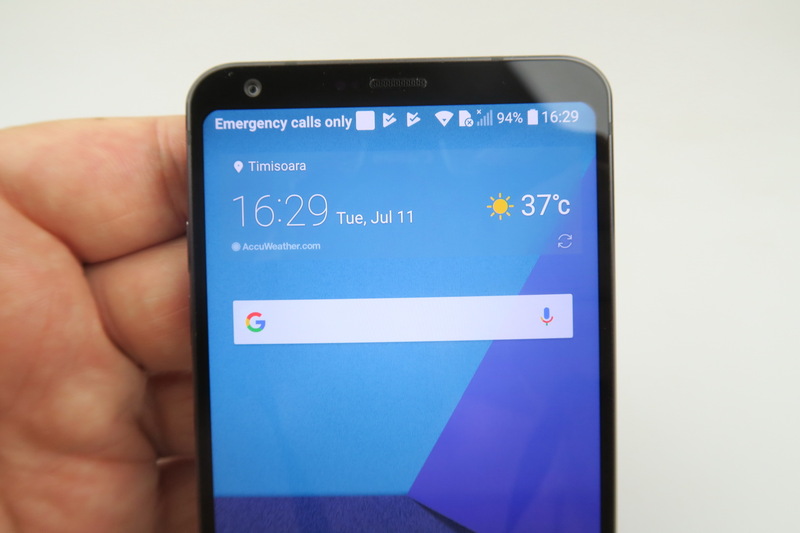 It’s superior to the LG V10 and LG G4, but scores even below the LG G5. The Pixel XL and Galaxy S8 have double that amount, so wow… LG dropped the ball this time. Charging is quite OK, at one hour and 46 minutes, which is OK and superior to the Huawei P10. Step by step charging revealed a time of 5 minutes necessary for a 5% charge, 15 minutes brought us to 15% and 30 minutes to 33%. One hour brought us to 72%. Settings for the battery include a Battery Saver, the option to block the Always On feature and there’s also a Game Battery Saver, that extends the battery life when you’re playing games with options like Extended, Max and Custom, which changes the resolution and frame rate. I would say the battery is seriously mixed… with a low continuous usage time. Moving to the acoustics, we get a single speaker at the bottom of the phone and some markets get a 32 bit HiFi quad DAC like the LG V20. Sadly there’s no stereo sound here, but the Galaxy S8 also doesn’t have it. The preinstalled music player has an EQ that lets you choose modes like Normal, Pure Surround, Quad Beat, Bass Boost, Treble Boost and custom, with 5 custom channels. There’s also a pitch and speed setup section. The listening experience involved a great bass, but also lots of vibration of the back. I would call the volume “mid level” and luckily we didn’t cover the speaker with the hand by mistake, so its placement is OK. The high notes and voice were all well rendered and well heard. We did a decibelmeter test and achieved 84 dBA at the front and back, while the LG G5 scored 86.9 dBA. We beat the Pixel XL and scored below the iPhone 7. In Riptide GP Renegade we reached 94 dBA, which is solid and superior to the Galaxy S8. Huawei P10 is louder though… The bundled headphones for the LG G6 are loud and clear, have a great bass, they’re comfy, but not much of a looker. A bit of their wire feels like a shoelace thingie. Finally, there’s also FM radio here. I would say that acoustics are OK for a flagship, but there’s no champion or groundbreaking material here. Time to see if the camera sets any records and beats the pretty solid LG G5 cam. At the back of the G6 rests a duo of 13 MP sensors, the first one with F/1.8 aperture and 71 degree angle and the second with wide angle of 125 degree and F/2.4 aperture. There’s OIS 2.0 only for the first cam, PDAF and dual LED flash. Both cams rely on Sony IMX 258 sensors and upfront we find a 5 MP wide angle shooter with 100 degree angle. Moving on to the UI, the camera app starts up fast, the focus is fast, but not Galaxy S8 fast and there’s an interesting “trigger mechanism” zoom, which actually the Galaxy Note 8 copied recently. You can choose the camera you’re using among the two at the back and the picture modes include Manual, with sub options like white balance, exposure, focus, ISO and shutter. There’s also Manual Video option settings. Auto and Square are other modes and Square splits the screen in two and the other bit shows a preview of the pic. The main capture modes are as follows: Auto, Panorama, 360 degree panorama, Food, Popout (frames basically), Snap, Slow Motion, Time Lapse, Steady Recording, HDR, Tracking Focus, Effects. Now off to the Gallery! The LG G5 achieved last year some excellent colors, with great calibration and the LG G4 before it too. The LG G6 seems to follow the same path, with crisp pics and great details during the day. I loved the contrasts of the pictures achieved here and the dynamic range. We also pulled off some nice closeups and I noticed that the LG G6 has a great way of capturing the golden hour light, close to sunset. Not one trace of blur was spotted and we zoomed in a lot, to great results. Details were excellent at all time. I loved the way the sky and the clouds were digitally rendered, an area where some smartphones tend to be rather underwhelming. The Panorama resolution was quite solid, at 18.960 x 3872 pixels. In spite of the strong sun, there was no burn and I feel that this phone is superior to the Huawei P10 on a similar weather and scenery. The wide shots were amazing, truly reminding me of National Geographic pictures and I’m not even exaggerating. The selfies are not impressive sadly, at least in the details department, but they have an OK texture and reasonably calibrated colors. It seems that the camera can’t handle the sun well, the front camera I mean. It’s clearly below what the iPhone 7 provides, for example. I’m surprised there was no Bokeh action on this device, something that most dual camera phones offer. We still have some of the best color calibration on the market and the wide camera is brilliant vor vacations, soccer matches and in general large and impressive sceneries. Overall I feel this is a 10 or 15% bump up from LG G5. Low light capture features good texture, but the zoom suddenly became poor and details dropped. The flash is not very powerful, rather mid level. Clarity is good and there’s a bit of a blue hue in the wide angle pictures. I feel that the smartphone was inferior to the Galaxy S8 and HTC U11 in brightness, but it can carry itself quite well in the contours and texture of buildings. There are some soft pictures without a flash, though. The street light halos have a decent size, at least with the main camera, while the wide angle one adds too much yellow to the night pics. I’d say that all in all it’s not bad, but it’s no match for the current flagships of 2017. Even the Pixel XL beats it. I’d put it on par with Huawei P10. When it came to shooting video, we used MP4 format, Full HD or 4K and 30 or 60 FPS options. We caught some great yellow hues, but the mic couldn’t cope with the wind well. There’s sadly lots of refocusing when walking around, so the stabilization is a bit poor. The sunnier bits get burnt and colors will feel that. The sky looks surreal with its weird hue of blue. Clarity was good and zooming in resulted in detail loss more often than not. The 60 FPS video, which by the way is shot with the wide angle cam had great colors and great sun exposure. Somehow the wide angle camera does better videos than the main one, don’t ask me how. The front camera also can’t take the sun, so forget about vlogging. There are some silver linings in this whole area, like the subtle exposure change when going from light to darkness and viceversa. We are clearly not in the same realm as the Samsung Galaxy S8 and HTC U11, which are superior in this bit. Even the Sony Xperias have an edge and the Galaxy S7 too. I don’t understand why LG didn’t get filming right, since I remember that the G4 and G5 also had some problems here. The only good thing was the 60 FPS capture basically. Maybe it was the extreme heat or 40 degrees Celsius? Looking back at some of the LG G5 videos, a part of me feels that the G5 is better than the G6 in filming. Low light videos are shot in MP4, Full HD and 17 Mbps. They’re very, very weak, grainy and the details are awful. There’s yellow and violet hues, but the object tracking was OK. The street lights were huge and the picture was shaky and vibrating when walking around. Stereo recording was promised with great fanfare, but it doesn’t get past “meh” in my view. I really can’t understand what’s happening here and tend to believe that we had a slightly defective (or not yet patched) unit. There are too many drawbacks for the video capture, clearly inferior compared to the other 2017 flagships. Moving further, the web browser of choice here is Chrome, which is rather fast. The benchmarks are mid level and the keyboard we used was rather big, plus we got a numeric row as a nice extra. On the connectivity front we’ve got Bluetooth 4.2, WiFi a/b/g/n/ac, WiFi Direct, NFC, DLNA, Miracast, as well as HD voice and WiFi Calling. An interesting feature lets you connect to musical instruments, like a MIDI device. Back to the connectivity list, we’ve also got 4G LTE Category 11, GPS and USB Type-C. The device comes in single SIM and dual SIM versions. Calls are loud and clear, there’s good noise cancelling and we’ve also got Speed Dial and voice mail features. The SpeedTest revealed a 4G download speed of 114 Mbps and upload of 49 Mbps. In the WiFi test we got to 258 Mbps in download and 25 Mbps in upload, all of them great results. We move on to the software, which is Android 7.0 Nougat with the latest custom LG UI on top. It’s called the Full Screen UX and basically works by splitting all the windows in two equal squares, whenever possible. It happens in the music player, Calendar, Contacts and a few more. The UI is flat, features intense colors and no app drawer. Multitasking brings a carousel and split screen and the dropdown area has an all white and clean background, with black toggles. We also have an Always On feature in the mix. Keeping the homescreen pressed triggers widgets, which feel a lot like the Samsung Galaxy S8 ones, to be honest, plus theme and home screen settings. Speaking of Settings, the core area features Smart Profiles, basically automating features of the handset. There’s a function I found on the LG G6 called Smart Doctor, that optimizes the device’s functioning and does a ton of diagnostics, something that you won’t see every day on modern smartphones. The fingerprint scanner has a 7 step setup and lets you unlock the screen or access locked content or locked areas. Its unlock speed is OK, but the animation is too long and makes the whole process feel slow. The leftmost homescreen includes the Smart Bulletin area, that aggregates LG Health, Calendar, Music and Evernote. As far as the preinstalled apps go, there’s 41 of them, quite a few if you ask me. There’s Quick Memo+, with lots of pens and brushes, Tasks, LG Health, HD Audio Recording and Google Assistant is also here. Don’t forget the LG classics, Knock Code for unlocking and Q slide for overlapped multitasked windows. Now that we’ve reached the end of the review, it’s time for the verdict. At least the handset has a strong personality and doesn’t try too hard to stand out of the crowd. A part of me believes that some of its drawbacks can be corrected by updates. It’s a pity, because some parts of the handset are great, while those are not are quite bad. You can get the phone here.